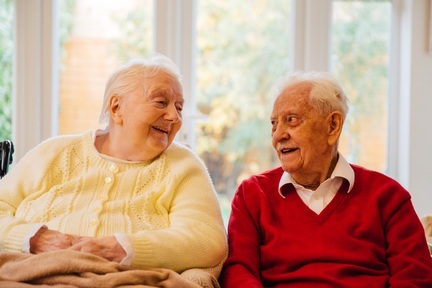 A couple in their nineties, who both receive live-in care, are still smitten with each other and “wouldn’t be able to cope if they were apart”. The pair have never been apart, except seven years ago when Marie had a fall and Ron visited her in hospital every other day. The couple met during the war in 1943. They first set eyes on each other at a dance in Middlesbrough and carried on their relationship through the war. Marie was training to be an English teacher and Ron was in the RAF working as an aircraft electrician on Spitfires, Hurricanes and Lancaster bombers. In 1948, worried that Marie’s mum would disapprove of them marrying, Marie crept out of her house and she and Ron went to the registry office and got married. Now 71 years later, they have three children, five grandchildren and three great grandchildren. His mum was the organiser in the family, who paid the bills and booked the holidays whereas his dad liked to tell ‘dad’ jokes. Marie has a really good laugh, Ron is quieter. They sleep in separate beds in the same room and they always wave to each other when they go to bed at night. They give each other kisses and they still hold hands when they sit next to each other. They will often have a laugh together. They are quite jolly people and Marie still says Ron is handsome.